Please note this blog post is no longer up-to-date. 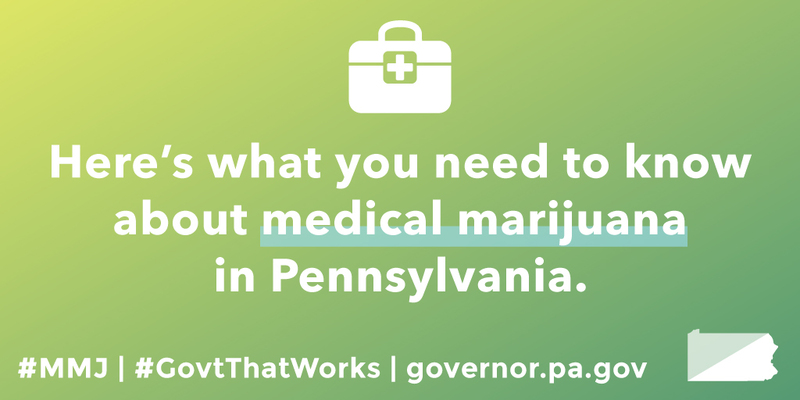 Please visit medicalmarijuana.pa.gov for the latest information on Pennsylvania’s medical marijuana program. On Wednesday, the Pennsylvania House passed Senate Bill 3 to send the medical marijuana legalization bill to Governor Wolf’s desk. The governor will sign the bill on Sunday. The passage of this bill is a thrilling success for patients and families who will benefit from this treatment, as well as for advocates and members of the House and Senate who have fought tirelessly for this cause for years. When will the Medical Marijuana Program be Implemented in Pennsylvania? Who will be Able to Access Medical Marijuana? What will the Department of Health Consider as a Serious Medical Condition? What is the Process for Patients to Qualify for Medical Marijuana? How will Patients Apply for Medical Marijuana Identification Cards? Can a Patient with a Serious Medical Condition Receive Medical Marijuana if they are Under 18? Can Someone Else Obtain Medical Marijuana on Behalf of a Patient? Where will Patients Obtain Medical Marijuana? Will there be Enough Medical Marijuana for all Approved Patients and Caregivers? When will the Department Begin Issuing Regulations for the Program? What else will the Medical Marijuana Program do for Pennsylvania? How can Pennsylvania Make Medical Marijuana Legal when it is not approved by the Federal Government? The term “medical marijuana” refers to using the whole unprocessed marijuana plant or its basic extracts to treat a disease or symptom. The marijuana plant contains chemicals that may help treat a range of illnesses or symptoms, prompting a growing number of states – including Pennsylvania – to legalize marijuana for medical use. Studies have shown that medical marijuana can assist patients suffering from serious medical conditions by alleviating pain and improving their quality of life. The Pennsylvania Department of Health will begin the process of implementing the state’s Medical Marijuana Program when Governor Tom Wolf signs Senate Bill 3 into law on April 17, 2016. The implementation of the program is expected to take between 18 and 24 months and, when completed, will offer medical marijuana to patients who are under a physician’s care for the treatment of a serious medical condition. Patients with serious medical conditions will be able to access medical marijuana with a physician’s certification at designated state dispensaries. To purchase medical marijuana, a patient will need to be under the continuing care of a physician who is registered with the Department of Health. The physician may then provide a signed certification to the patient stating that the patient has a serious medical condition. The patient must then apply to the department for an identification card. Once the patient receives an identification card, he or she can purchase medical marijuana at an authorized dispensary. Identification cards will be able to be obtained with certification from a registered physician and a completed, approved application submitted to the Department of Health. The Department of Health will make it as easy as possible for patients to apply for medical marijuana identification cards. The department is reviewing how it can make applications available to patients on its website. A patient under the age of eighteen must have a caregiver who is approved by the department in order to obtain medical marijuana. A caregiver can be a parent, guardian or an individual approved by the department. Yes. When a patient applies to the department for an identification card, he or she can designate up to two caregivers. A caregiver can assist up to five patients. Before obtaining medical marijuana for a patient, a caregiver must also apply for a medical marijuana identification card. Only a patient or caregiver with an identification card issued by the department can purchase medical marijuana at an authorized dispensary. The department will authorize up to 150 dispensaries across the state. The department will be reviewing a number of factors to determine the placement of dispensaries across the state in order to ensure that medical marijuana is available for patients with serious medical conditions. The department will be conducting a full population study during the next 6 months that will include the location and number of patients suffering from serious medical conditions and their ability to access public transportation to get to a dispensary. The department has started working on temporary regulations in order to meet the 6-month publishing requirement under the statute and will be meeting with stakeholder groups, medical professionals and consumer groups to develop the application process for patients and caregivers to access medical marijuana. The new law creates the Medical Marijuana Advisory Board within the Department of Health. Members include the Secretary of Health; the Physician General; State Police Commissioner; Chair of the State Board of Pharmacy; Commissioner of Professional & Occupational Affairs; President of the Pennsylvania Chiefs of Police Association; President of the Pennsylvania District Attorneys Association; members to be appointed by the Governor and the four legislative caucuses who are knowledgeable and experienced in issues relating to care and treatment of individuals with a serious medical condition, geriatric or pediatric or clinical research. One member appointed by the Governor shall be a patient, a family or household member of a patient or a patient advocate. The Medical Marijuana Program also includes funding for research institutions to study the use of medical marijuana to treat other serious conditions. In addition, the act establishes an advisory committee that will review these research findings and make recommendations to the legislature for changes to the act. In addition to funding for implementation and research, the act also provides revenue to the Department of Drug and Alcohol Programs for drug abuse prevention, counseling and treatment services, as well as to the Pennsylvania Commission on Crime and Delinquency for distribution to local police departments. The federal government cannot force states to criminalize conduct that is illegal under federal law, nor can the federal government force state and local police to enforce federal laws. There are no known cases in any of the 23 states that have authorized the use of medical marijuana of the federal government prosecuting an individual for a small amount of marijuana.